The J3504 Big & Tall Ergonomic Chair is made with a wide seat and neck roll to ergonomically position your posture. 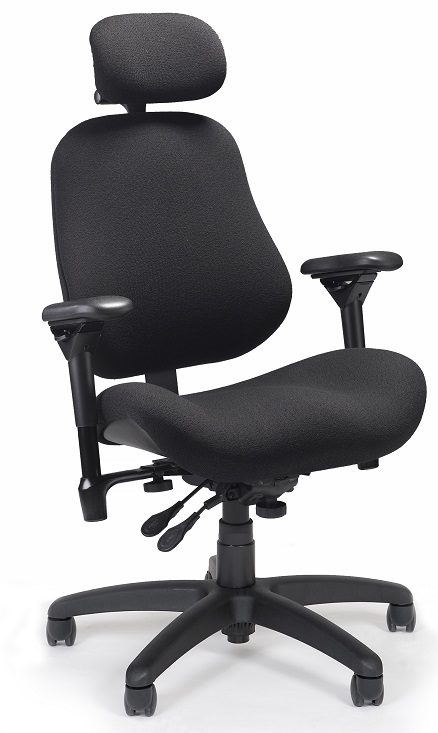 Rest assured with an XL chair from BodyBilt, for seated professionals up to 500 lbs. Feel the comfort of a broad and contoured seat designed for your body. For seating that fits individuals of larger stature, BodyBilt's XL chair has a larger seat pan, and chair arms that are not only wider but also higher to support the arms while working. The strength of the ErgoGenesis chair arms are designed to withstand up to 750 pounds outward force against the arm, providing the strength and support needed for a larger person to get in and out of the chair. The XL chair has a moderately contoured seat pan, and is weight rated to 500 pounds. The J-Mechanism is available with an adjustable back height and tilt, allowing the integrated lumbar support to position at the correct height for the support of the low and mid back.